There are many apocryphal versions of how and when the pork pie was invented, but the most common theory is that they originated in Melton Mowbray. This town is situated in the Vale of Belvoir and is otherwise famous for its stilton cheese. The chief byproduct of this cheese is whey, which is an excellent pig food. 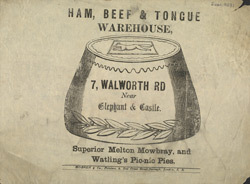 The local dairies began keeping pigs, and making pies with pork filling became both economical and popular. Melton Mowbray is now home to the Melton Mowbray Pork Pie Association, preserving the history of the local pie.